Project Rooftop, for those unaware of its existence, is a website where various artists submit works that consist of costume redesigns for various superheroes from all comic book universes. Submission is pretty open, as long as you link to your creative website/digital portfolio and that the work is of an original design. Occasionally, the run design contests that are judged by panel and NOT by popular vote. The reason I emphasis that point is from my own disasterous experience participating in a digital pirtfolio site,Talenthouse, and their Create A Superhero contest, that resulted in basically established artists blowing everyone else out of the water and people with shareware creating superheroes from templates that get more votes than struggling artists. See any similarities to the current Kickstarter debate? The Stealth Mode design is essentially the uniform without the color. 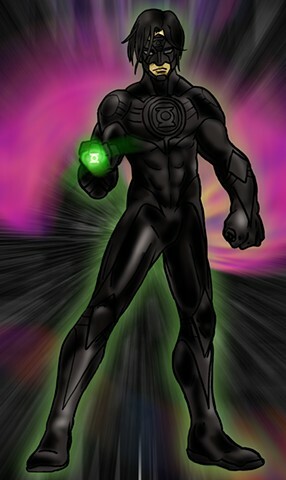 I got the idea from an issue of Green Lantern where Sinestro taught Hal Jordan how to make the suit turn dark for a stealth mission to Sinestro's home planet of Korugar. I liked the idea of the person having to "will" the "green into black" for steath and the intense concentration involved in maintaining the look that I feel it should be a standard procedure for all Lanterns. After drawing the picture, I inked with with a brush pen and colored it in Photoshop. The glowing emblem is actually a piece I designed in Illustrator that I rendered in Photoshop. The Body aura comes from me taking the base body color, changing it to green, glowing it via filters, then blurring it and adjusting the opacity for the final effect.